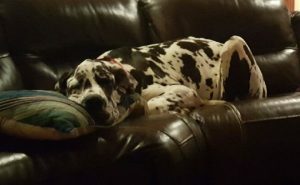 Abstract: An one year old neutered male Great Dane with inflammatory bowel disease (IBD), while on multiple medications and a special diet, continued to have diarrhea, in addition to significant polyuria/polydipsia (PU/PD). Owner was frustrated with the lack of progress with patient’s disease and presented Griff for acupuncture. Within two weeks, Griff’s stool started to firm up and he was able to go longer between bowel movements. After three treatments, Griff had normal stool at times, improvement in PU/PD, and, for the first time in the six months of being with this owner, made it through the entire night without having to go outside to defecate. History and Presentation: Patient had chronic large and small bowel diarrhea when adopted by current owner approximately 6 months prior to presentation. Medications originally attempted included prednisone, Tylan powder, Metamucil and Floracil, which did not help appreciably. Referral to an internal medicine specialist led to endoscopy which revealed a markedly thickened duodenum and biopsies supportive of IBD. Griff was started on 1 mg/kg twice daily (BID) dose of prednisone, along with 22 mg/kg dose of amoxicillin BID, and continuation of the Tylosine (3/8th tsp BID). Diet was changed to O/M. Blood work performed two weeks prior revealed elevated hepatic enzymes (reported verbally by owner). Owner also administered a probiotic daily. This treatment has been in place for one month prior to presentation with no significant change to bowel habits. Owner reported PU/PD, Griff being unable to get himself into the car and continued uncontrollable diarrhea every 2-4 hours. Physical Examination and Clinical Assessments: Upon presentation, Griff was found to be bright, alert and responsive, though less energetic than expected for a puppy. Body condition score was 3.5/9 with moderate abdominal distension and palpable hepatomegaly. Muscle atrophy noted, especially along the topline and the skull. Remainder of traditional physical examination was unremarkable. Neurologic exam was within normal limits. Myofascial examination revealed sensitivity to palpation in the thoracolumbar region, tension in the cervical region and sensitivity when palpating the stifles bilaterally. Trigger points were palpated in the semimembranosus muscles close to the origins unilaterally or bilaterally intermittently at some sessions, but not others. No additional diagnostics were performed. Medical Decision Making: Goals of acupuncture were to decrease sympathetic tone, improve comfort, support liver function and promote homeostasis of the gastrointestinal tract to increase nutritional absorption and decrease clinical signs of IBD. musculoskeletal examinations. Cervical tension could be due to top line wasting from chronic prednisone use leading to abnormal overall movement and carriage of a large puppy body, tension of the muscles from abdominal discomfort, or overall anxiety from the amount of life changes that have occurred in such a young dog. Stifle sensitivity differentials include congenital lesions, panosteitis, musculoskeletal soreness from continued posturing and straining during episodes of frequent diarrhea, etc. Definitive Diagnoses: IBD was established via histopathology on endoscopically retrieved biopsy samples. Liver stress, likely due to medications and chronic GI issues, was established via blood work results (conveyed verbally by owner) showing elevated hepatic enzymes. Acupuncture Treatments: The internal medicine specialist directed all medications (continued taper of prednisone, tylosin and probiotics, with amoxicillin discontinued prior to the second session), and owner started adding in oral supplements, at her discretion, including chamomile, cinnamon, yogurt and applying topical tea tree oil. All acupuncture points were initially dry needled, with electoacupuncture added starting during the third session. Acupuncture points selected included the following: BL18, BL19, BL20, BL21, BL27, BL28, to promote appropriate hepatic function, especially in light of extensive high steroid dosing, and to facilitate appropriate gastrointestinal motility. These points also neuromodulate the signals impacting spinal cord segments affecting the brain gut axis in an attempt to alter the enteric nervous system. To decrease the sympathetic input to the nucleus tractus solitarius, ST 36 was used for its parasympathetic mimicking properties and to reduce discomfort associated with his disease. PC 6 was considered but the patient was quick to lick at things on his front end and due to his strict diet, food distractions could not be used to keep his attention, so this point was not attempted due to fear of needle swallowing. SP 6 was used during some sessions to neuromodulate via the tibial nerve in effort to modulate feedback to the local spinal cord autonomic segments. To decrease overall stress level and support immune system function, Bai Hui, GV 20 and GV 26 were chosen for their effects on overall mental well-being. Local trigger points on the semimembranosus muscles and cervical muscles were also addressed as indicated. Massage was performed on YinTang, along the top line and throughout the lateral abdominal areas and hips to provide relaxation and relief from muscle tightness at each session. Outcomes, Discussions: Griff’s improvement was noted starting two weeks after acupuncture sessions were initiated. These were documented by the owner via pictures. His stool started to firm up, defecating frequency decreased and his overall energy level improved. Additionally, his abdominal distension decreased and his top line started to fill out, though these effects are likely due to the decrease in prednisone from 1 mg/kg PO BID to PO SID. Owner is very satisfied with the improvement noted so far in his quality of life and plans to continue with acupuncture with the hope that some, if not all, of the other medications can be decreased or discontinued in the future. nerve stimulation – a potential treatment for faecal incontinence? Ann R Col Surg Engl. TNF-α in rats with ulcerative colitis. World J Gastroenterol. 2003;9(5):1028-1033.